Established to the renowned northern Barossa Valley sub regions of Koonunga and Moppa, Westlake take aim aim to capture the soils and seasons in which these vines grow and to celebrate their differences, ensuring that each vintage will have its own story to tell. By combining a colourful convict past and traditional Barossa heritage, Westlake look forward to continuing a unique story. Ultra rare, hand crafted, Barossan wine with a difference. Right from the start, the vision was to produce the best possible fruit from estate vineyards in a sustainable way, ensuring that the environmental care would benefit future generations. From that came the urge to complete the cycle and make wines from fruit that was only sourced from estate vineyards, tended by hand throughout the year. 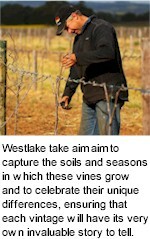 The philosophy behind Westlake wines was to capture the soils and seasons in which these vines grow and to celebrate their differences in the bottle. This ensures that every vintage release is a direct reflection on what the vineyard endures throughout the year. Completely open to the forces of nature, there have been some vintages which were not released, due to the fact that they have not reached the highest standards. Rest assured that if it's in the bottle it is good. Finally, there is not much point in doing this if you don�t enjoy it or have anyone to share it with, so it is with great joy that Westlake can share with friends everywhere to celebrate what they do. Nestled amongst the rolling hills at the northern fringe of Barossa Valley is the highly prized Jaensches Vineyard, in family hands for three generations. Although the soils vary across the block they mainly consist of shallow red brown top soils over heavy red clays, scattered with ironstone and quartz. The variations and aspects of each plot provide us great blending material, adding complexity and depth to our wines. The picturesque Higgins Block Vineyard, located in the sub region of Koonunga, with its gentle slopes falling down to the gum studded creeks, really isn�t a bad place to work! This part of the valley has the ability to produce amazingly concentrated world class wines that are highly sought by collectors world wide. Jaensches Vineyard crops and canopy levels are naturally controlled due to the hard nature of soils and climate. Wines from this block typically display dark fruits, with rich colours and ample tannin structure. Jaensches vineyard has been planted to varieties that are suited to the site such as Shiraz, Cabernet Sauvignon, Durif, Grenache, Mataro, Petite Verdot and Viognier. Higgins Vineyard soils consist of shallow red brown top soils over heavy red clays, famous to the Koonunga region to Biscay like soil over red clay. With its rows running East/West it has proven to be ideal in controlling canopy size and crops levels already impressing with spectacular fruit, displaying wonderful aromatics and colour. Planted to Durif, Graciano and several clones of Shiraz, Westlake look forward in showcasing the results of vintages well into the future.